We went to Cal Pep for dinner last night and, I have to say, I don’t think I have ever enjoyed myself more in a restaurant! Cal Pep, by reputation, is one of Barcelona’s best Tapas restaurants. 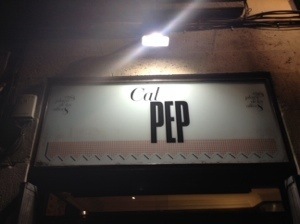 Cal Pep opens its doors for dinner at 7:30pm. And when we arrived at 9:00pm, the place was absolutely hopping. The restaurant seats about twenty customers who all sit diner-style at a long counter and have the opportunity to watch the two Tapas chefs work their magic. There is very little room behind the counter for the two chefs, the four serving staff and the three bus boys but they seem to manage as if it is a well-practiced dance. We only had to wait ten minutes or so to find a spot at the counter. Less than fifteen minutes later the place was suddenly packed with tourists, most of them Americans as, we discovered, they had just started their Spring Break. And because the restaurant is so small, I had the opportunity to listen in on all kinds of conversations as the people waiting behind me were less than a foot from my back. Simon was seated beside a young German woman on his other side and, thanks to her flawless English, they got chatting and spent the better part of the meal in animated and intriguing conversation. Simon’s conversation with her meant that I was free to watch the goings-on around me without feeling I was ignoring my partner and I, in turn, did not feel the least bit ignored. I think the most amusing aspect of Cal Pep was the ordering process. One of the waiters approached us and asked, in broken and heavily-accented English, if we had any allergies or, God-forbid, were vegetarian. We knew better than to launch into the long list of allergies…gluten, dairy, corn…and just told him that I am a vegetarian but that fish and seafood would be perfectly acceptable. He spent a determined few moments asking if I could have a little bit of ham, a little bit of pork or even just a bit of chicken. We assured him that none of the above were preferable but to go-to-town on the seafood. He seemed a bit disappointed in my meat-free insistence but finally acquiesced. Simon and I turned to each other laughing as we recalled the funny scene from My Big Fat Greek Wedding…’that’s okay, I’ll make lamb’. Once we had established allergies and preferences, I assumed we would get a wine list and a menu. However, neither of those things happened. The waiter asked us whether we wanted four of five Tapas dishes and what we wanted to drink. We told him five Tapas, beer for Simon and red wine for me. And that was the end of any input from us. While we waited for our mystery order to start arriving, we noticed that the Spanish-speaking patrons were not only offered menus, but wine lists as well. At Cal Pep, life is moving far too fast to accommodate us fumbling English-speakers so they take full and unapologetic control. What I have not mentioned yet is the owner of Cal Pep who is a short and rather rotund man dressed in his chef whites. He has big glasses, a loud voice and speaks absolutely no English. He commands the chaos like an army general and nothing escapes his notice. Every few minutes he will clap loudly when one of his staff needs to attend to something or other. While I observed the jovial and steely owner, plates started materializing in front of us and my wine was produced from an enormous bottle. I had absolutely no idea what type of wine it was but I was certainly not challenging the authority of the staff on their choice for me! The food was absolutely delicious and piping hot. Watching the precision and talent of the cooks was inspiring and the barely controlled chaos of the tiny restaurant was utterly bewitching. Simon was still busy with Cristina, the German woman, so I just ate my meal and basked in the chaos. Just as I was launching into my artichoke chips, I was aware of a commotion behind me. Part of the Cal Pep protocol is to enter the restaurant and walk to the end of the line behind the diners along the counter. 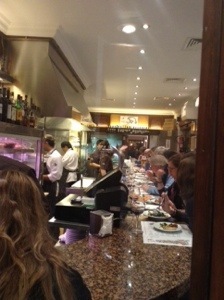 As soon as places become available at the counter, the ones furthest into the restaurant are seated. Apparently, the system had become a little mixed up and a loudly insistent man from Manhattan was voicing his disapproval at the fact that there were people in front of him who had arrived after his party, which consisted of his teenage daughter and heavily bejewelled and gorgeously coifed wife. Watching one of the waitstaff try to explain that he was aware of the order of patrons and that they would be seated before the party in front of them was fascinating. It was completed with finger actions of walking people, whistling and a funny kind of humming. As the American man was directly behind me, I had front row seats to this comical attempt at communication. As luck would have it, the Manhattanite was eventually seated beside me, so I had the opportunity to witness what I knew was coming next. What I found particularly interesting was that the owner quickly materialized to take the order from the Manhattan family. There was much back-and-forth in loud Spanish and loud English. Why is it that when someone clearly does not understand our language, we think that talking louder will smooth out the communication? Eventually, a wine list was produced and selections were made. The Manhattanite had to fight hard to get a bottle of water as the owner seemed to be trying to communicate, as he patted his round belly and had his hands to his throat, that water was not good for anyone, and that they should just stick to wine. The man was not amused by these antics but I was transfixed…and they hadn’t even tried to order food yet! I’m sure you can imagine the tug-of-war that occurred over the food ordering. And, to add insult to injury, the man’s teenage daughter was a vegetarian and no amount of hand gesturing, waving of arms, or belly-patting from the owner was going to budge her, or her infuriated father, on her eating preferences. By the time the Manhattan family’s food arrived, the man was so angry that I am sure he had to choke down every bite of his food. As I compared his dining experience with mine, I realized that where I had had fun letting go of control and going with the flow of Cal Pep, he had tried to assert control over an environment that was, unapologetically, having none of it. As we made our way out of the bustling restaurant and into the narrow alley outside the restaurant I was absolutely delighted to have spent our last night in Barcelona in the company of such diverting, delicious, and hilarious surroundings. And it reminded me how much fun letting go of control and going with the flow can be! And, truly, if we can’t let go of control when we are in someone else’s intriguing culture, then when can we? When we awakened this morning, Simon and I made a conscious decision to do far less walking today than we did yesterday! And so, with this intention in mind, we purchased ‘Hop-on, Hop-off’ bus tickets so that the bus driver could take care of getting us to the sights and we could just enjoy them. We have had a fun and hilarious day together for our last day in Barcelona. Simon was at his very funniest and I feel as if I have spent the whole day laughing like a lunatic! It is a little cooler today but the sun is still out in full force. We are heading home to temperatures that are at least 20 degrees colder than what we have been enjoying here, so we soaked in all the sun we could. We finished our day in the Barceloneta district down by the beach. A couple of yummy Mojitos and an order of fresh cut fries in a funky surfer/skater bar. Then a walk along the boardwalk to home. After a quick shower, we are going to head out for dinner to a restaurant a few alleys over called Cal Pep. 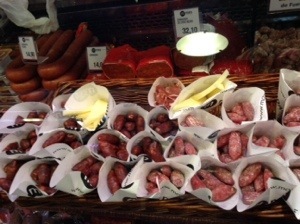 It is reputed to be the best tapas in Barcelona and fills up fast. We tried to eat there the other night with Simon’s colleagues but the bar-style seating did not lend itself to a party of six people. It has a lively atmosphere and a delightful chef who circulates with a big smile on his face. We are excited to eat superbly and to celebrate our fabulous visit to this wonderful city! 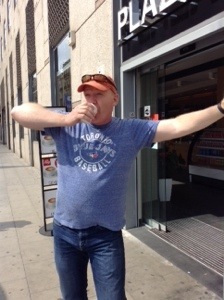 Simon hamming it up with his tiny coffee…certainly not a Tim Horton’s medium! A vegetarian and allergic to cheese…these meat and cheese cones will not be my afternoon snack! 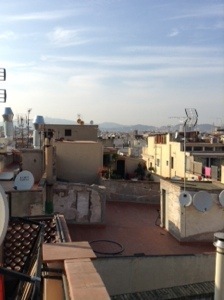 Simon and I just got home from our dinner in the Barceloneta district of Barcelona and we are both completely pooped! As we made our way up the steep and numerous stairs to our apartment a few minutes ago, Simon’s Nike Fuel Band informed us that we have done 17,700 steps today. 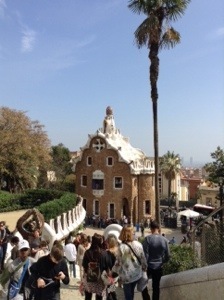 What the fuel band did not tell us is that most of those steps were up some of Barcelona’s steepest climbs! I am so tired I can hardly see straight so this post will be mostly pictures. Barcelona’s Arc de Triomf on our way to the Sagrada Familia. 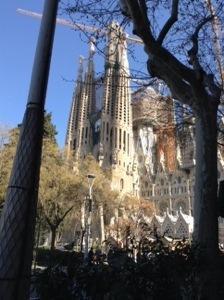 When we arrived at the Sagrada Familia at 9:30 this morning there was already a long wait for tickets. However, it was there was well worth the wait. 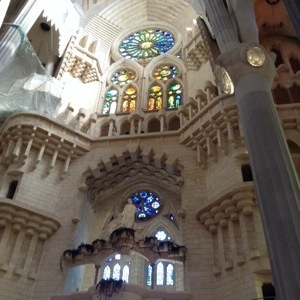 I was absolutely blown away by the beauty of Gaudi’s basilica. The whole structure was unlike anything I have seen before. 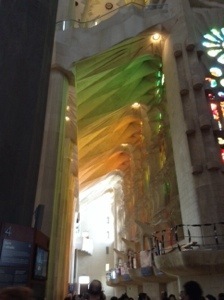 The stained glass windows were particularly beautiful and the play of light coming through them was breathtaking. 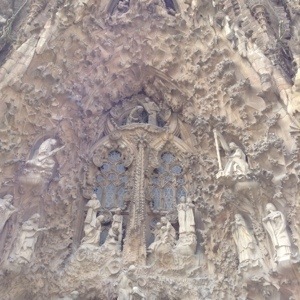 We were also amazed at the intricate stonework on the outside. 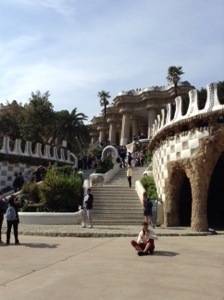 After leaving the Sagrada Familia, we decided to head to Parc Guelle, another of Gaudi’s masterpieces. What we did not realize is that it was a very steep and very long climb to get there. Here is a picture taken near the top of our climb. 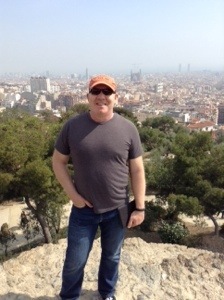 Barcelona is spread out behind Simon and the Sagrada Familia is way in the background over Simon’s left shoulder. 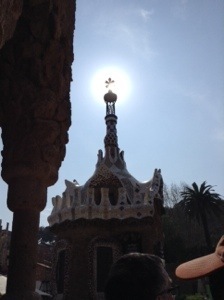 Parc Guelle was a delightful visit and the whimsy of Gaudi’s architecture made us feel as though we had stepped into a Dr. Suess illustration. By the time we got home we were totally pooped. Simon headed for a siesta on the couch and I headed for the sunny rooftop. There is nothing beautiful about the rooftops of Barcelona but it was wonderful to bask in the afternoon sun, enjoy the view, and listen to the various church bells pealing all around me. 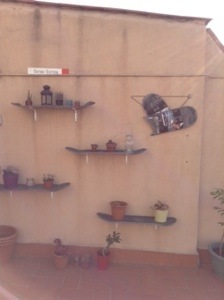 I also love the skateboard shelves on the wall of the patio…makes me miss my Max. 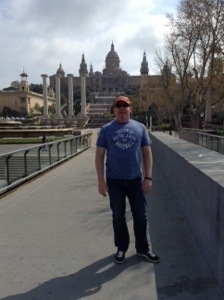 After a nice long soak in the little bathtub, I was refreshed and ready for seafood paella in the Barceloneta district. At 8:30 at night I am always amazed how empty the restaurants are except for us tourists who do not tend to eat dinner at 11:00 at night! I have left Simon having a siesta at our beautiful apartment. I am sitting in the delightful sunshine by the water in a gelato cafe having, you guessed it, a lemon gelato. It is 5:00 and the sun is still warm and lovely. 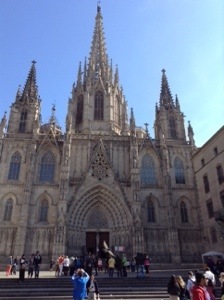 I have had another fabulous day in beautiful Barcelona! After packing my bag and moving out of our hotel room this morning, I hopped the subway to head into the city. As I easily bought my ticket and found my train, it occurred to me how quickly we humans adapt to new surroundings. Yesterday morning I was fumbling with money and the ticket machine and today I felt like an old pro. I was so relaxed I even played Solitaire on my iPad on the way into town instead of anxiously watching every single stop to make sure I didn’t get lost. 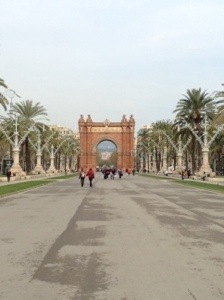 My first stop was the Arc de Triomf (yes, Barcelona has one too). After that I headed north on foot with a relatively vague idea of where I would find the Sagrada Familia (Gaudi’s famous cathedral). My intention upon arriving there was to purchase tickets for Simon and I to tour there tomorrow. 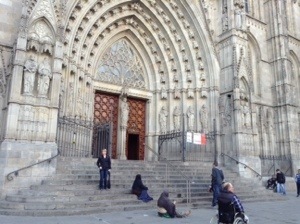 Turns out I couldn’t buy tickets but it was awesome standing outside and enjoying the splendour of the cathedral. I even had a cup of tea a half block away and basked in the beauty. After my cup of tea I walked toward the Placa de Catalunya (known as the nerve centre of the city) and thoroughly enjoyed the Modernista architecture along the way, including one of Gaudi’s incredible buildings. I arrived at the Placa de Catalunya just as Simon texted that he had finished his workshop and was on his way to The Born (the area of the Barri Gotic in which our apartment is located). The Barri Gotic is the old quarter of the city which was built on the old Roman town. Again, I had a vague idea of the direction in which I should be heading and was entranced by the tiny alleyways as I wound my way towards our apartment to meet Simon and our landlady. Just as I located our address in a tiny little alley, Simon pulled up in his taxi. We unloaded our bags and tried to hunt down the landlady to no avail. 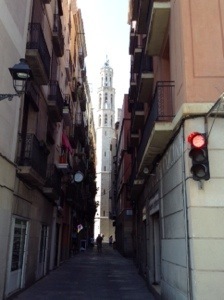 As luck would have it, there was a Tapas market in the same alleyway so we decided lunch and a sangria was in order. Just as we were finishing lunch, our landlady strolled in and we were greeted with a warm embrace and kisses on both cheeks. We had a glass of sangria with her and then decided to head up to the apartment. Considering that the building was built hundreds of years ago, it should have occurred to me that there would be no elevator. What might not have occurred to me is that the stairway would be almost too narrow to manoeuvre with my big suitcase and that the sangria had gone straight to my head. I am in very good shape but that walk up almost did me in! Our apartment is absolutely charming with a gorgeous rooftop garden. After getting instructions from the landlady, we took possession of the keys, did a few minutes of unpacking and then headed out to wander the Barri Gotic. Well, it is now close to 6:00m and the sun is starting to lose its warmth. 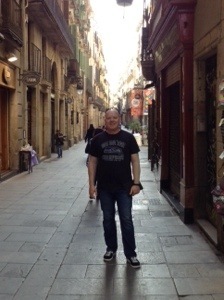 We are meeting Simon’s colleagues for dinner at 8:00, which is actually embarrassingly early for dinner in Barcelona. We might be the only ones in the restaurant! 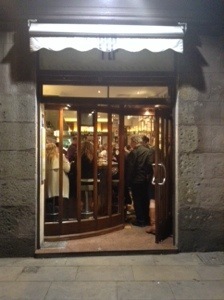 Apparently it is the best tapas restaurant in Barcelona and just happens to be a 3 minute walk from our apartment. I am so excited to spend the next two days exploring Barcelona with Simon now that he is finished his work and can relax and be a tourist with me. 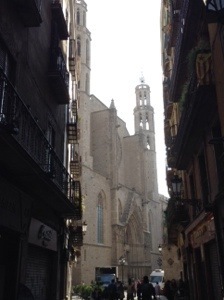 While Simon delivered his workshop today, I discovered Barcelona on my own. And, I have fallen absolutely in love! 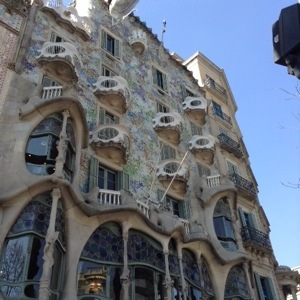 Barcelona is beautiful, charming, friendly and intriguing! I decided that I wanted to see as much of the city as I could today so I purchased a ‘hop-on, hop-off’ bus ticket. There were three different lines and I managed to ride the two best ones. And now when Simon and I have our two and a half days together, I have a good idea of what we should do. And, my last highlight is the pot of Earl Grey tea I am enjoying in the beautiful hotel cafe.